Northeast Queens high schoolers are third most likely to graduate, studies show. Thanks to living in northeast Queens your child is very likely to graduate from high school on time. 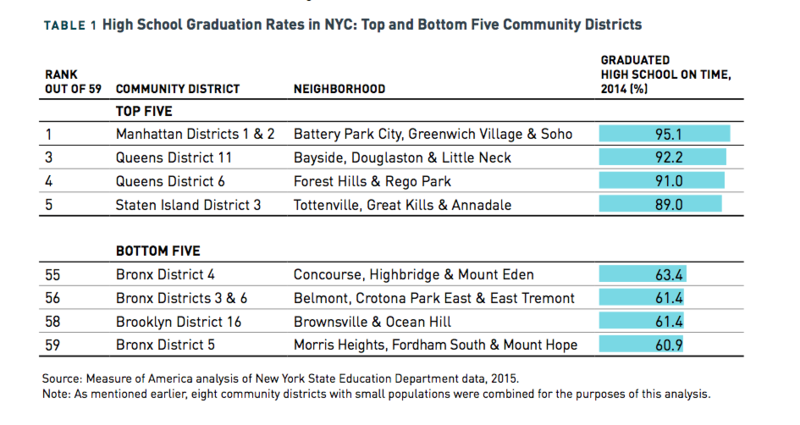 Queens District 11, which encompasses the neighborhoods of Bayside, Douglaston and Little Neck, ranked third out of 59 New York City districts with the highest graduation rates in 2015, according to a recent study by the nonpartisan initiative Measure of America. Approximately 92.2 percent of high school students residing in the three northeast Queens areas graduated on time in 2014, reflected the data. The highly ranked Queens District 11 followed closely behind Manhattan’s Community District 1 and 2, which include Battery Park City, Greenwich Village and Soho. These Manhattan districts tied for the number one ranking, as more than 95 percent of students there have graduated within four years. The research inferred that where students reside is still a strong determining factor that influences whether or not he or she will graduate on time. Furthermore, “disparities in on-time graduation rates by neighborhood are greater than disparities by race, the report found, with 34 percentage points separating the best-performing community district and the lowest performer,” DNAinfo first reported on Wednesday. As a short-term initiative, researchers at Measure of America are urging the city Department of Education (DOE) to add more guidance counselors to reduce their caseloads. They also hope that the department uses this data as a guideline to implement a strategy that will bridge the gap in graduation rates by neighborhood. “To fix the system in the long term, the DOE should ensure there are more good high school options across the city to chose from,” noted Sarah Burd-Sharps, co-director Measure of America. Measure of America is an initiative of the Social Science Research Council (SSRC), which analyzes data that emphasizes human interest issues such as health, education and living standards. SSRC is an independent, international, nonprofit organization, founded in 1923, that is run by a board of directors and social scientists who conduct research on major public issues.